HARPURSVILLE, New York. 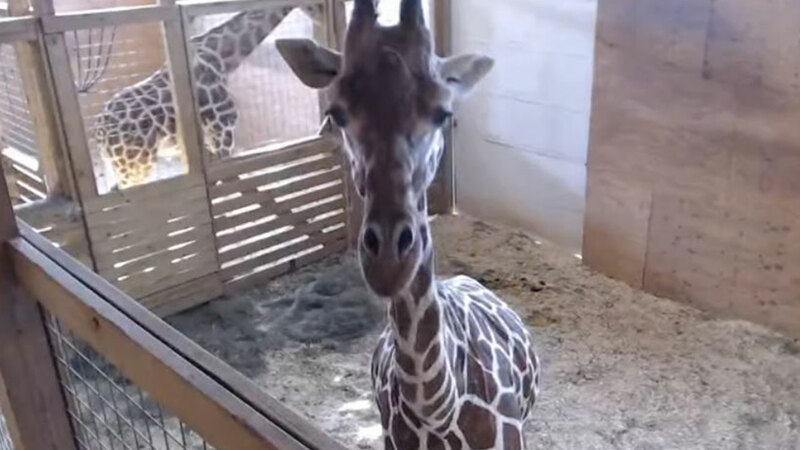 (WPVI) -- April the Giraffe is having a baby, and she's ready to give birth at any moment! Still. After two weeks of watching. A live camera feed shows the expecting mama's pen at Animal Adventure Park in Harpursville, New York. RELATED: Before April the Giraffe gives birth, here are five fun facts about the adorable species. Did you know that giraffes can run up to 35 mph? Check out these fun facts about giraffes. April, who's 15 years old, is having the baby with Oliver, a 5-year-old giraffe, according to Animal Adventure. This is Oliver's first calf, but April knows the drill - this will be her fourth. April has been pregnant for 15 months, the normal gestation time for a giraffe. When she finally gives birth, her calf's front hooves will come out first, followed by the snout. He or she will weigh around 150 pounds and will stand about 6 feet tall. April will raise her calf naturally, and weaning could take between 6 to 10 months, maybe longer. Oliver, however, will not assist in raising the calf. Male giraffes, according to Animal Adventure Park, "only really care about two things - fighting and the unmentionable." So because of fears of inbreeding, the calf will be relocated to another facility once the weaning process is over. Make sure to keep up with this live stream: Once the calf is born, Animal Adventure will have a contest to name the calf!